Wear it "message out" to start the conversation, or wrap it to keep inspiration close and personal. Whether you wear it "message out" to start the conversation, or wrap it to keep inspiration close and personal, this everyday scarf brings your look and womankind together. 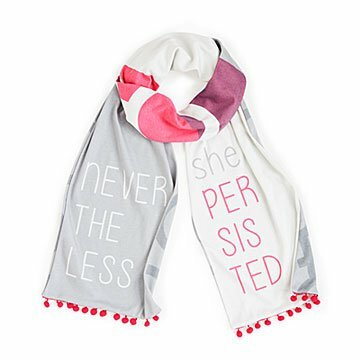 The now iconic words "Nevertheless She Persisted" are printed one one side, and a bold pattern of female symbols on the other to create a statement piece that celebrates the unity of sisterhood. We designed it in a pink/gray/white color-block palette and soft t-shirt fabric that compliments any look, and added playful pink pompoms—because everyone needs a cheer section. Made of imported and domestic materials in Brooklyn, New York. Cold water wash delicate, tumble dry low. My scarf was a summer-house-visit gift from my sister. I admire her thought and the scarf's combined message and whimsy. Plus the bouncy little pink balls. Am now buying one for a friend's something-th birthday and a second for my daughter, who is SO jealous of mine. I LðŸ’œVE UNCOMMON GOODS!!! Last year got the New York Times for my Dad and Mother in law!!! You have the best gifts!! Thanks for all the hard work and finding such great products!!! Really cute, and great that you can hide or show the message for versatility! If you are willing to make a political statement (which will probably be understood only by a minority of people), this scarf is the best. The other people will just like it for itself. I bought this scarf for a journalist friend, who really appreciated the sentiment. The first item I received had not been stitched correctly and it did not hang right. I called Uncommon Goods and they replaced it. The new one is great and I'm sure my niece will love it when she gets it at Christmas! I hope she likes this as much as I do. I might need one for myself!